Major Midwest Blizzard on tap-- with a little ice POSSIBLE here. A simply huge storm is about to unfold that will bring a large swath of snow from Oklahoma to Maine. This map is somewhat over done with the large 20+ inches, but its get the point across that this is a HUGE storm. Just SE of that heavy snow band will be large amounts of sleet and freezing rain. Some of the freezing rain amounts over parts of MO, IN, IL and OH will be crippling. For our region, the MAIN thrust of rain will be liquid-- however. The data has suggest overnight Monday into Tuesday some light rain and drizzle falls with temps in the 29 to 31 range. These events can be the worst because there won't be much media talk and that THINEST of glaze can be missed before several accidents across the region. December 7, 2007 we had an event that dropped .01 of freezing drizzle between 6am and 8 am. It was missed by the models and was a traffic nightmare. Oddly, I went to bed around 1 am thinking-- if this doesn't dry up we are going to have a rough AM. And, at some point around 7:30 or so they flashed on the TV-- police recommend every stay off the road until temps warm up. Our high in the afternoon was 41- but temps were below freezing until 11 AM. Most model data shows between .03 and .05 that starts after midnight tomorrow night and is gone before 10 am. Temps get into the mid 40's or warmer Tuesday afternoon. Wednesday will be crazy warm-- 60 is very possible and will cool back to the 40's for highs on Thursday. Another storm approaches Saturday, and taking the models at face value, will be warm for region for snow or ice. Late Monday into Early Tuesday there will be a minor ice threat. As a low pressure develops over East Texas the warm air advection will zoom over the cold dome at the surface and bring us a shot at a little freezing drizzle. Precipt amounts will be less then .05 of an inch, so the icing will be minor but some traffic concerns early Tuesday. As the low cranks up the bulk of storm is rain here Tuesday night and Wednesday. Cold air filters in after this event and we are back to seasonal levels. Some most model data suggest that a trailing piece of energy spins a storm up heading into next weekend and we have a threat for some rain or snow. Track at this time is favorable for snow-- temps are the issue. All model trends have been away from ice. If the moisture doesn't plume to our north before the warm up, we still could see the some minor icing late Monday night and early Tuesday. Liquid amounts are under .05 of an inch on both models I scanned. The small amount of ice could make for rough travel but all data has us well above freezing shortly after mid day. After this storm, some data suggest a storm goes JUST off shore and misses our area. If it nudges west, we could be looking at a shot at snow. This is in the "not likely, but keep your eyes open" department. Enjoy the nice warm day- My youngest finally gets to ride his Thomas the Train Big Wheel he received from Santa outside the house this afternoon. Ice event still looming-- doesn't appear to be significant, but still watching it. Certainly, I tend to update more when larger events loom. The pending event Tuesday-Wednesday has SOME promise to be a marginal ice event. Some of the early model data had leaned towards a decent snow that changed to sleet and freezing rain, and they've moved to maybe a quick shot of sleet into freezing rain. SOME data shows temps in the upper 20's--which would make for a day of pretty bad travel, but no threat of power outages or down tree limbs. As of now, I see there being a 6 to maybe 12 hour window where we could get some freezing rain. As the heavier precipitation approaches, we lose our connection to the parent high pressure and the "banana" high (piece that extended) over upstate New York slides out to sea. This is an impressive cold air mass coming down and a slight shift east of that MASSIVE arctic high will greatly influence the storms impact on our region. Start time as of now is late Monday evening into Tuesday morning. If everything goes well, we are all rain by noon Tuesday. Will update tomorrow-- As of now, 60% odds this is an advisory level event, 15% warning (.25 of ice or more) and 15% it's a non event. BTW, don't be afraid to click on an ad if you see something you may like. Sign up for Groupon, great deals offered! Any "click" money that comes to be is being saved for a better website. Not hard to be much better then a free blog. Also, comments and feedback are not only welcomed, but expected. Our "ideal" snowstorm has a high pressure located over the Eastern Great lakes into Upstate New York. The clockwise flow gives us a steady supply of cold air and forces the system to our south and east. Like this last system, the storm high is exciting well in advance of the storm near Feb 2. This last storm, the high was WELL east and warm air had taken its place and we need the rapidly developing low to cool the atmosphere. This time, as of now it appears as the high exits the storm approaches but high will be much closer and cold air more available. I'd expect a period of sleet/snow initially with a longer more extended period of freezing rain that possibly ends as rain. There is a STRONG ice signal because often the computer models run a little warm at the surface when we have this type of cold air damming. At this point, one model keeps our temps below freezing the entire event. 4 days out-- still subject to tweaks. There could be a snowshower this morning that coats the ground quickly. Paging Vanilla Ice? ?..and a couple cool photographs. I'm home from work today with the schools being closed. (What was the deal with Bedford being 2 hours late and waiting till 8:45 to call it off??) and had some fun with my kids. Scanned the mid day models-- the Feb 2-3 event is on track. First guess is leaning towards sleety icy mess. We've not been able to get the High Pressures in the favorable spot for our region in these big events. This is an evolving storm that is in the 5-6 day window to just keep in mind., We also may see a brief snow shower or two tomorrow AM. First regional total map for yesterdays event- 75 miles off! My hometown of New Castle DE-- crazy day--- 4 inches of unexpected heavy snow in the morning, a driving rainstorm late afternoon. (about a half inch of rain fell) and back to heavy snow in the evening. Daily total of snow was 10.5 inches. Thunder snow video-- The tremendous energy aloft supplied many instances of thundersnow-- This is a video from outside Philly. His reaction is classic-- He's clearly a snowfan. Lastly, Cool photo from Tolland, CT. Kevin is a friend of mine that I'm in a fantasy football league. 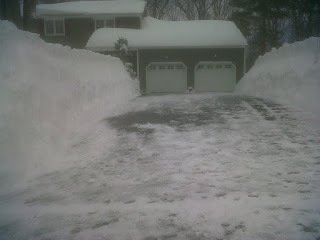 He did all this shoveling by HAND-- over 40 inches since the first of Jan. Looks like 8 foot crests? On second review-- and a glimpse into the future. We did get some much need precipitation-- .90 from the rain/sleet and snow combined. About .40 fell as snow. Sadly, because the temp profiles were a tad warm, we had bad crystal growth and they melted fast into that mush of an inch. I use a tool called bufkit-- which does a vertical view of the clouds that tells what types of flakes are going to fall and how will they accumulate. While not an exact science, its a tool to be listened too-- the best it ran as I tracked this event was 3.8 inches. My belief that it was wrong was wrong-- while it often gave us no accumulation due to a rain snow mix, it did note the poor snow growth. Adding the hourly report and subtracting half the hour of .20 which had some sleet too gives us .35 that fell as snow. Tack on the half inch of sleet we had and 4 inches wasn't that far away. We are going to remain cold through middle February. I've mentioned a term called a "Sudden Stratospheric Warming" in the past-- while that sounds crazy a simple definition is the Stratosphere (Almost in outer space) suddenly warms and pushes the cold in the Troposphere. ( towards earth) When these happens, cold outbreaks are not far behind. We are in the midst of one and the cold comes early February. Snow and storms?? I'm watching an event for Feb 2-3. Track and temps are not yet defined. Assuming the first 10 days of February are cold-- often cold snaps are ended with larger storms. Feb 10-15 is a random guess. Also, cold flows to allow for "Clippers" little storms from Canada. Most dry up in the mountains or traditionally go to our north, but we could fine one that digs a little more due to large ridge on the west coast. The bad news-- my 4-8 or 3-7 won't work in this. The good news, those who went 4-6, 3-5 won't be right either. Just cheked radar and its winding down REALLY fast. We may see 1-2 inches, but the snow is SO wet that its melting on the bottom and compacting as fast as it lays. I would not be shocked if the official if we get another half inch or so at best. I've got about .8 of an inch on my official snow board, but its a big pile of slush. I expected the rain, some sleet-- but expected much stronger banding on the backside when we changed to snow. We had some nice snows, but even the past hour with .09 of liquid falling, the snow depth didn't really increase at my house. If we had persistent snow bands, the temp cools a little more and the snow piles up faster. Ideally, I' thought we'd get 3-5 inches in 2-3 hours and while some of the RAIN bands had that much liquid, but not so much when we flipped to snow. Some of the modelling data stated this was possible, as the upper air support nudged a little further north each run. Still a big ticket event from Harrisonburg to DC up 95 to Boston. Expect a late night or early AM mid range outlook. Radar looked very promising to me, then start to sink SE rather then move NE-- We have a few hours left of snow, but I'm not seeing the intense banding that I had hoped. How we get our 3-7 if its going to happen. Link to live radar-- watch this evolve. Sleet mixing in Ferrum to Roanoke to NRV, marching east. Snow not far behind. No changes to snow totals--- Low side near 460 is 2-3 inches, if switch is early and good banding, 5,6 is possible. Reports of sleet and thunder in Grenta. Extreme vertical motion changes places to the DUE south of Lynchburg to sleet. The Fast and Furious- My final outlook. Simulated radar view-- not often we see YELLOW returns for snowfall. Having a first grade daughter, I've been watching the schools close today. Likely a good call because although I expect the snow holds off to between 12 and 2 in Lynchburg, any slight change could make this very bad. I do my best to be objective and not hype-- keep track of me on twitter, facebook or this blog. If your school doesn't cancel, and you have the means, get your child home by 1 PM, get yourself off the roads. 4-5 inches isn't a huge amount of snow but 4-5 inches that falls in 2 hours is a huge deal. That's blinding snowfall rates and the roads will be a MESS. If you can't do that, plan on working late and driving home 7 ish when the road crews have had time to clear things up. I can not stress enough how rough travel will be in that 2pm to 5pm window .If you have friends and family up towards DC to Philly, they are going to get BLITZED with 6-10 inches (local maxes of 12 very possible), most falling in 4-5 hours. Winds are a little gusty as I type-- coming out the NE at 10 w gusts to 20. Hatteras Light house has winds gusting over 50, inferring the coastal low starting to crank and when the upper air support reaches east of the Appies, this thing really blows up. I've made a new map to show better how this plays out. This is akin to tracking a severe thunderstorm. final call-- Fast and Furious, best snows fall in 2-3 hours. Late evening trends-- a baby step back. Watched most of the evening data roll in..
We have a very dynamic system heading our way. My biggest fear all along has been the "north" trend that the models often show. 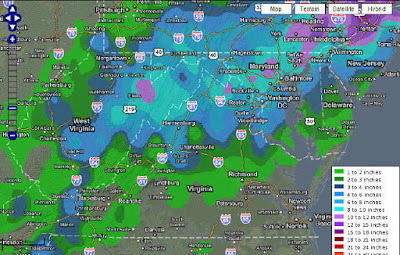 Consider the Dec 18-19 09 event that the models had dumping 2 inches of liquid here in Lynchburg-- all snow, 20 inches. Ended up with 14.5 here at the house-- about 75% of the total possible. The models in the last second jogged something called the 700mb a little to close. If you've heard the term dry slot-- it basically is a place in the development of a low that a wedge of dry air works up. We never got into the dry slot, but sat close enough to turn hours of HEAVY snow into hours of LIGHT snow. My point-- some data is pulling the 500mb low just a little too close. This is the catalyst, the gasoline that makes our system go. There is a physical connection between the exact tract of this feature and the snow bands that will develop. The more north this 500mb low travels, the shorter time we spent in these bands. The less time, the less snow that falls. My original call was 4-8. Since I jumped on that number early, I am completely OK with being graded on that amount. If I had waited, I'd likely thrown out 3-7 for the regions marked 4-8-- based on the data today. SOME data shows 2-3 inches, with a shot at 5-6 depending where the banding sets up. My point-- grade me on the 4-8. meaning if the official totals from LYH and ROA are 4, its a win. I'd lean towards 3-7 being the range at this point, the 7 being in the places where the best bands set up. If you are wondering why I can't say exactly where-- these are like a thunderstorm. One can pinpoint a region where these set up, but not an exact location. Random example-- Roanoke gets 3, Bedford 5, Forest 4, Evington 5, Concord 7, Spout Sprints 3. Best snows fall between 1 and 5 PM..
Grade me on the 4-8, now expect 3-7. Because you're mine, I walk the line-- Mid day update. Some of the data infers that the snow is all but done at 7PM and our best snows fall between 1 and 5 PM-- a little quicker compared to before. There's quite a bit that could go wrong, but so much about this event looks great. 1. Temps are borderline-- will start as a mix or rain and change over. Any delay kills the forecast 4-8 inches. 2. The pieces in motion are not set in stone, any deviation can change a forecast. One concern is the upper air support nudges just a little too far north and spares our region the best snows. 3. The overall storm will be moving fast. I've made some assumptions that it snows hard for 4 hours give or take. If the development is SLIGHTLY delayed, we have issues. 4. Some of the model data races the precip out of the MNTS area pretty quickly leaving the Mt. Empire and NRV on the lower side of accumulations. 1. The models all have about the general same idea-- the fine details is what makes this a 2-3 inch event or 6-8 inch event. 2. The model ideas are slowly clustering towards a general track. 3. Dynamics-- strong upper air low. History tells me this blows up early and not later. Thundersnow is likely some places, especially to our North. No Basic Changes--yet?? Winter Storm Watches issues for the Blue Ridge West. Most of you know I'm a guy who always loved weather-- even took a couple years online classes in the early 00's and do this "tracking and forecasting" all winter. I'm usually tempered with calls and yesterday and I pushed the BIG BUTTON a little early. I was hoping the model data would increase my confidence but reality is it dropped somewhat. The basis of this was model support was growing for that solution with some adjustments made on climatology and past behavior of systems like this. Last nights model runs where ALL over the place-- most give a minimal of 2-3 inches and some get closer to the 8. In a set up like this, the exact track of the upper air support ( the tv guys often show a little swirl in the clouds away from the surface low) will make all the difference. Also, often its possible SOME areas verify in the 4-8 ranges while others fall short. During the March 09 storm-- Most of the Lynchburg region had 8-12 inches while 15 miles away in Big Island had only 3 inches. No major changes today-- Final call after tonights model data. The model data is trending exactly where I had hoped. First half of the storm will be to warm for snow. I had held out some hope that we might cold enough, but not it's in the cards. The storm has trended SLOWER as first thought were this could be a Monday event and now its a Wednesday event so our cold air support is gone. We are totally dependent on the storm to make its own cold air. Surface low from the Gulf of Mexico across east NC to near the Delmarva. It is a little disjointed from the upper air low but does drop between .25 and a half inch of rain. As the upper air support approaches we flip to snow. Its taking an ideal track as modeled. It doesn't have to do that--so there is some open chances this changes. We have plenty of wiggle room from the south--as some of the data first plaster Winston Salem and move it Northeast at us. Between a half inch and literally an inch of liquid can fall in the snow band-- considering its wet snow, 4-8 inches. Attached is a graphic from the model output-- it can be hard to read. First column I've marked is surface temps. Second is temp at 5k feet and third is liquid that falls. The air is chilly and raw. As the upper air low approaches from the west, the air cools, which had been running from about 35-40 degrees from 5k feet down rapidly cools. The light drizzle suddenly has huge rain drops mixing and rather quickly the rain becomes heavy. The TV breaks in and announces 8+ inches has fallen in places in North Carolina and heavy snow is now falling in Blacksburg, Roanoke and Martinsville. Perhaps a quick rumble of thunder and suddenly a flake of snow appears. Quickly, more and more snow mixes in and suddenly it all snow. Surface temps drop to 32 and flakes the size of pancakes are falling. Heavy snow lasts for 2-6 hours. While flapjacks no longer fall from the sky, such large flakes, the size of silver dollars are not often witnessed around this parts. With the wet nature of the snow, everything is plastered. Trees branches that stand tall in the sun now scrap the ground under the heavy weight of the snow. As quickly as it started, the snow has tapered to just flurries. This upper air energy is similar to the March 1-2 09 event. That event was much colder and we had snow on the front side. The upward motion in the clouds was so great that before the second band of snow came in--we had 20 minutes of graupel where the fast upward movement precluded the snow growth. Pic from that event-- this is in the two hours were 5 inches fell. 12:30 AM March 2, 2009. As we get closer to the event-- it is slowly coming into focus. Challenging event to say the least and really, we won't truly get a true read until about 24 hours out. Sometimes I break down model data by model, from this blog forward, I'll just describe how I think it unfolds. Model data has about settled on a storm track-- its just the amount of moisture and the exact temps we have to deal with. Our HP leaves and since the storm is now a WEDNESDAY event-- the cold air is our biggest obstacle. We cool enough for snow only due to a truly dynamic system. Storm forms in the Gulf of Mexico and heads towards the South Carolina Coast. Rain breaks out over most of the region including the Mountains. Mountains change to snow a little quicker simply due to the elevation. As the 500 MB low moves into a favorable position, rain rapidly changes to snow from the mountains east. Thermal profiles drop to right near freezing from about 5k feet down making this a TOUGH event. A couple degrees too warm and it snows, but hardly accumulates. This type of event has the potential to have 3-4 hours of VERY heavy snow. What can go wrong?? While I'm convinced the storm will bring needed rain, if the 500 MB track is wrong, we will not get as long of a period as snow. I've listed 2 inches as the low side-- which seems reasonable as of this time. Also, intense bands could set up-- where place A sits under a band for 3 hours and gets a nice event while region B sits on the outside and gets minimal accumulations. Any significant changes in the track, strength and speed of the 500 mb low will change our forecast. I've slightly adjusted it north compared to model data as is now. Only changes made to the outlook map is moving Roanoke to the 2-8 zone. Elevation will be a factor-- so just outside Roanoke city will do better. Early Morning 1/24/2011 for the 1/26 event. Click to enlarge. 1- Slightly warm-- Mostly snow, NRV and Mounts, Rain to snow a little quicker in ROA, A COLD rain in LYH that ends as a little snow. Everywhere else-- RAIN. After reading these models for 10+ years-- they TEND to be a little too cold aloft and a little to warm at the surface in winter precipitation events. I can't rule out some freezing rain as the event unfolds either. Clear as Mud?? Early outlook map included- hand made! Slowly, we are coming to viable solution--My confidence is a little lower, especially compared to last winter where we knew early and often a big event was coming. Rather than breaking down model data, I'll place chances on each event happening. Model data has slowed this event down, which is actually good because another piece of high pressure TRIES to build in. 20% Storm chuggs WAY inland and its mostly rain, WELL into the mountains get snow. 60% Something close to my map happens. Description- Low develop as foretasted in the New Orleans area and slides to a position just east Charleston, SC and moves NE from there. Places along and west the Blue Ridge are mainly snow and 6-15 inches fall, middle regions including Lynchburg start as a mix or rain and change to snow. 2-8 inches, depending on the time of the change over and exact track of the 500 mb low. South and East regions start as rain and will mix or change to snow eventually. A couple inches can't be ruled out, but without significant cold air it may just snow a couple hours and not accumulate. **Track of the 500 MB low is huge** When you get under or near the track of this, a couple to several hours of heavy snow take place. This event is moving pretty quickly, but this is a wild card. I spent some time looking for a decent map to start showing my ideas better. Because I need a white background, a google map is the best I can do. Please click to get a good look. Better than handspun shakes from Chick-fil-A. GGEM (and the NAM extracted) go negative tilt to early and chung the the low as an inland runner. This would be a driving rain storm with maybe a little snow to start and maybe a little snow to end. Note on the top image that low pressure is in WESTERN NC-- That's not a good snow track for us. Once the low passes to our east the upper air support COULD support some snow, but those don't always work out as modeled. The 12Z ECMWF slide a little east and is basically just concentrates all the precipitation on the coast. The precip maps are the least reliable feature, but it does bring caution at this point. The inch line of precipt is from near Raleigh, NC to RIC to DOVER DE-- Well to our east. Guns those areas with a little spill over to our region. Taken literal, about a quarter inch of liquid that falls as snow. In what is NO STUNNER, the GFS moves away from the Miller B ( Storm forms off the coast rather then rides out of the Gulf of Mexico) It is now a Miller A that rides the coast from the Gulf of Mexico, but matches the EC with not much moisture in our area. Actually, much less and once it reaches near Cape Hatteras it goes out to sea. Miller A -- grazes our area. This run looked great until about hour 90. I am concerned about the low level warmth displayed on the models, even the ones that offer some snow. Usually, its safe to assume that the models are too warm a the lowest levels, but most of our grandparents had a nice catchy phrase about ASSumptions. My plan is to view the evening data and have some type of update tomorrow AM-- things SHOULD become a little clearer at that time. Happy 24th Birthday to the Twin Big snows of 87-- Could we celebrate with repeat? January 87 was on of the "analog" winters I cited last year for my winter forecast(Winter 09-10) and it actually worked well. Most of the snow that winter was centered around the time period of Jan 22 until Feb 22 for our region. Jan 22 and Jan 25-26 had back to back snows of close to a foot over most of central and southwest Virginia. I'm not sure how the event was forecast down here because at the time I was living in Delaware. Up there, they played catch up all day. Initially, we had a Winter Storm watch-- but the forecast called for 1-2 inches with a change to rain. By my bedtime, we had been upgraded to WARNING with 4 inches expected and then a change to sleet and rain. The next morning, the ante was upped right before the storm started to 6-8 inches with a possible mix and once the storm started that was upped to 8-10 inches. About the time we hit the 8 inch mark, they upped us to foot. Schools were not cancelled and snow begin to fall shortly before my bus arrived. We basically sat in first period while they decided what to do with us and by 10 am we were on the bus home. Took us a couple hours to get home ( I lived 3 miles from my school and had the LAST stop of the day) In Delaware we had a couple sleet pellets late, but nothing to hold down accumulations. Both Lynchburg and New Castle, DE had about 12.5 inches from this event. Lynchburg had 3 hours of VERY heavy snow where 5 inches fell in that time frame--- Here is the total snowfall map AND the hour obs for the day here locally. Most places had between 12-15 inches because it was a fast mover. Click the second map to increase size--I've highlighted the hours where snow was heaviest and 5 inches fell in three hours. I'm still tracking an event for the the 25 and 26 of next week (To celebrate our second of the Twin Storms of 87??) There are three major models that extend that far, one is the GFS-- an american model, The second is the GGEM, from Canada and third is the ECMWF, from Europe. Both the GGEM and the ECMWF dive some energy from the PAC NW of Canada, dump a little over the SW and bring it all out to create a storm in the Gulf of Mexico. Same issues sit as yesterday where the cold high is retreating but the low chugs JUST far enough east in todays data to provide a mainly snow episode compared to yesterdays snow to rain and back to snow scenario. The GFS doesn't dig that energy as far SW befor ejecting it and we get a Miller B system ( Miller A- Storm out of the Gulf of Mexico, Miller B has a secondary development of the East coast. Historically, most of big snows are Miller A's. We get the all snow, maybe 2-3 inches in the GFS scenario. While this is an option I'm not willing to pull off the table, I don't see as the most likely outcome. Even the short term model called the NAM that goes out to 84 hours shows a much different synoptic set up compared to the GFS. In the end, someone's going to be wrong, and at this time I believe it will be the GFS. The GFS ensembles ( The model run multiple times to weed out bias issues) also "hedge" that this is not the most likely set up. Once we establish the general track, we begin to focus on the fine details of the temperatures and exact track to see if and when what area's turn to ice/rain. Because the existing cold air mass is rather strong, ice is a much bigger threat than normal. While I much prefer to have a forecast nailed down, this could come down to "nowcasting"-- checking radar and obs. In preparation, add me as a friend on Facebook (Ketih D. Huffman) or make a twitter account Lynchburgwx. Crazy night on the models-- MONSTER low possible. Rain?? Yes--This storm could be an 1-81 special where all of 1-81 in VA gets SMOKED. Tonight's literal data showed about 18 inches or more along 81 and it drops off rapidly east of there due to mixing with and changing to rain. Why- We have a great cold air mass in place, but it is leaving just as the storm approaches. This creates two issues. First, we are losing the cold air support and secondly, this is more conducive to a low that tracks JUST inland. Looking at the above map-- If the H noted just east of Maine was sitting back 300 miles to the west, we'd have an all snow set up. As that H has been moving east, the cold air is also moving out. This is a VERY wet system. A region wide 1-2 inches of precipitation. Note: Nothing is in stone yet and much can change as we watch this storm evolve. So, this is something to track. 5 days away so plenty can and will change. The data takes the low from near Myrtle Beach to literally just on top of us. Reality is that it could be 100 miles either side of that line and that the thermal profiles could be a few degrees off either way as well. So, the next couple days we work on track and exact temps. Lastly, if the energy aloft (500mb or 18k feet) doesn't phase or work together, we have a low but much weaker. Teaser- Tonights ECMWF was all snow in Roanoke and 15+ inches. In LYH, it starts as snow and just about the time it gets really heavy it mixes with and changes to rain. 2-4 inches has already fallen. Rain is heavy and water is logging down the snow Almost an inch of rain falls during this time period. While the change to rain was a slower process, the switch to back to snow comes with rapid force and snows heavy. Temps are just above freezing and the snow struggles to accumulate at first. Another 2-4 inches falls on the back side. Temps slowly drop and as it ends in flurries, we are at 30 degrees and drop into the mid 20's Wednesday night. The slushy mess freezes into skating rink. A little ice overnight-- Watching Friday for the next event. A pretty moist storm system is developing just to our south and will move up the coast. Because another system is to our west providing warming aloft, we won't see a major ice or snow out of this. However, with a colder air mass in place, the system will have some sleet and freezing rain overnight-and actually maybe a flurries late day and early evening. Temps will be very close to freezing and it should not be a big deal. However, if the temps are just a smidge colder, we could have more of a rush hour mess tomorrow morning. Another cold front sweeps across the region Friday and a storm is forecast to form along this front as it passes our region. Exact time, track and amount of cold air are still in question. I'm not as "sold" as I was on this now compared to 2 days ago. As always, updates come as needed. The cold seems to bend, but just won't break..
As discussed in my early morning Friday blog, we were forced to accept the second half of the winter warm up predicted in my seasonal outlook won't pan out. And while the models have hedged at some warmer days compared to the minus -9 average from December the overall outlook was cold. We have an event on tap for late Monday into Tuesday. Data is still not clear, but 2 systems approach our region-- one well to the north, and one down along the gulf. There is a MINOR amount of cold air remaining in our region from this cold stretch and depending on the amount of moisture that get into the area will determine the total impact. Late Monday night, A mix of sleet and freezing rain will develop and eventually change over to rain. Tough forecast-- the models have shown anything from next to nothing all together, to 2-3 inches of snow and sleet to freezing rain, to just a good soaking rain. As of now, I think we get a little sleet to start, several hours of light freezing rain changing to rain near dawn on Tuesday. Southside may be spared most of the ice threat while the NRV could start as a little snow. Another arctic air mass approaches late next week near the time a low pressure forms in the gulf. As of now, the cold air lags JUST behind the storm, so the air in front could be a little to warm, especially east of the Blue Ridge. This could end being an I-81 special where the elevated regions to our west get a decent snow and we get a messy mix or just rain. Cold air fills the region after this. From here-- it seems the cold bends for a few days, never breaks and remain cooler then normal on average. Behind the system now COULD be some of the coldest air of the season. First, quick updated about the earlier snow. My 1-3 inch call was a little too aggressive and we did have a longer period of freezing drizzle than first anticipated. My great intentions of updated the blog went under. If you read this and do not have me as a friend on Facebook, please add me as I will stream updates on there or add me on your twitter account. The good-- The cold pattern developed late in November as anticipated and lasted all month in December. Mid January the pattern has broken down,. As foretasted, it has been dry with no major snow events. The December 16th event has been our largest snowfall of the season. My snowfall outlooks have verified well, all within, even if just barely the range allotted. ( December 16 was a 3-6 inch call with 3 inches and 2.2 for a 2-4 for Christmas day. The Bad-- While getting the general idea for a cold December right makes me happy, the pattern was much more amplified than I first anticipated. Much more is code for record setting amplified. My thoughts of a HISTORIC cold outlook from 10 days ago looks really bad. Yes, its been colder than normal but nothing historic. The Ugly-- Nothing remotely close to a pattern that resembles ice threats, much more intense blocking. Also, while the pattern is shifting, I doubt the cold is mostly gone for the winter. We have a rain threat Monday with MAYBE a little sleet or freezing rain in the front side. *Nothing major* Something called the PNA spikes (PNA is a ridge over the west coast). This brings a colder pattern to the east, but NOTHING to lock in cold air or slow down a storm. Something called a "Sudden Stratospheric Warming" is linked to a -AO -- and one of those could be in the works (I'm no expert in the this process, just know the impact, here is a wiki link of you want to read more http://en.wikipedia.org/wiki/Sudden_stratospheric_warming ). What this COULD mean is a return to the stronger blocking we had in December. I've not noted the updated information from this, but this usually takes a few sides of 10 days to re establish the colder pattern. The bottom line is it weakens the polar vortex. When the polar vortex is weaker or in several smaller pieces it allows for blocking to dominate. Moving forward, My guess is that the first half of my winter outlook is going to be MUCH better than the remainder. It does seem like this will be a more intense winter cold wise and the snow card has basically 8 viable weeks to play out somehow seems bleak to verify with a 5-10 inch allowance I predicted.. La Nina winters are NOT known for historic events, and yet we've had 2 on the east coast--- the Boxing day event and this past Sunday to Wednesday event that just slide past our region with a minor dusting. We've officially clocked 7.4 inches this winter in Lynchburg and I expect this to increase. Putting aside the dry nature of this winter, the overall pattern has been NOTHING like a La Nina and there are not many signs that this will end anytime soon, just breaks. One of the points of my outlook was that seasonal pattern changes often weaken and mute the impact of La Nina's. If we get a Sudden Stratospheric Warming-- the impact would likely be the first 2 weeks of February. At that point, the long wave pattern is starting to make the seasonal change to spring and the impact of La Nina is drastically dropped. So, I'm hedging colder overall for the remainder of the winter, just not as cold as December. Snowfall hasn't been hard to come by--but hasn't been anything significant. My guess is that we could move the seasonal total is more like 10-15 inches this winter rather than the 5-10 forecast. And, we live in the middle. The storm appears to be developing as I expected--with big snow totals over much of the deep south. My college city of Chattanooga, TN COULD get 10 inches. This storm weakens and drys out as it approaches our region. Among the reasons, DRY DRY air-- temps between 5k and 10k feet are at -10 c with dewpoints BELOW -30. So, we could have snow aloft (Virga) for 12 hours or so-- plus the systems upper air support is dying out-- the moisture transport from the Gulf of Mexico is gone. Next-- Energy diving in from the Pacific NW tracks just to NW and invigorates our storm JUST north of our region. My home base growing up of the New Castle, DE and Chadds Ford, PA region look to get maybe 6-10 inches while NYC to Boston look to get a foot. Region precipitation map- note how it swings around most of the VA region. NRV and Southside- 2-4 inches. Southside may get a little freezing drizzle for a period as well. ROA to LYH-- 1-3 inches. My guess as of now-- 2.2 inches for Lynchburg. I must say that I just hate this storm coming our way-- so many good things about it that simply can't deliver for many reasons. A strong southern short wave spins a storm up in Texas and it heads east, However, the block causes this energy to dampen out and the storm loses its punch at our doorstep. A second piece of energy swoopes down from the Pacific Northwest and regenerates the storm-- but its just a little too late for our region. As of now, I'd predict 1-3 inches from late Monday into early Tuesday. We are very cold for a couple days after that, and then get a brief warm up before another arctic surge. Map from the HPC--- precipitation outlook. Note the minimum over most of our region. The Southern low dies our, it meanders off shore, to be energized JUST to our north. The ridge out west isn't large enough to cause any digging of the second piece of energy to drive it more south. Looks like a DECENT event in Philly and a LARGE event for NYC to Boston. The cold is still on tap as discussed in my last blog. As usual, the extreme version won't be as likely-- much much colder then normal, but some of the cold trickles into the pacific northwest and the core of the cold sits in NW Canada sending pieces down towards our region. Doubt we get below zero unless we get a quite the snowfall but lows and highs both average 6-12 degrees below normal for the next 10 days. The warm days will reach 40 at best and the cold days will struggle to reach freezing. For a reference point-- the average high for this time of year is about 44 and the average low is 25. As an arctic front drops through today-- a piece of vorticity swings to our south and and could bring some flurries or even a dusting of snow. Places along i40 in NC could see a couple inches from this event. The Big Show is far from decided. Set up- Cold air settles over the region and a strong shortwave heads east from the south Cali coast. Low pressure forms over the deep south and heads east. Because of the strong block over the NE--this original short wave gets sheared out and our low doesn't deepen and loses the moisture transport from the Gulf of Mexico. As a result, what was putting down over an inch of liquid over the TX to GA areas is suddenly very dry. A second short wave races east from the Pacific northwest and at some point re-energizes the storm.The quicker this happens, the bigger of a storm we get. How much snow is possible? If its a smidge late-- we get a 1-2 inch snowfall. If its a tad faster- 2-5 inch snowfall. I'm not willing to commit either way at this time. Both pieces of energy are just coming ashore on the west coast and as they get close with better sampling data for the computer models, we should have a better handle on this. COOLER in the first half of January leading into moderation. Someone Que the Price is Right lose music, because I'm going to be wrong. Very wrong. We are about to have an arctic invasion, perhaps one not experienced in 25 years. (Jan 1985) The next two days COULD get to near normal before the bottom drops out. Why? The perfect global set up to drive cold air over much of the United States. The first wave of cold air begins to filter in later this week with even a chance for a few flurries and snow showers. It will be cold, but not anything historic. This map is valid for the 13th at 7PM--that's a cold look. (Temps reflected are at 5k feet) Would translate into highs in the 20's to maybe low 30's and lows as low as 10. Preceding this cold COULD be a possible snowstorm. Timing is huge to when the cold air works in VS the energy coming from the current California Storm- if the cold is a little to quick it shears out the energy and we get nothing. Also, some of the data has wanted to have a SMALL window where the low works up to our west . Hard to see that as a possible outcome, as the most likely way we miss this event would be sheared out and to our south. This model called the GGEM shows a possible solution to how we could get some snow. The next frame moves it out to sea, so its not a HUGE event, but would be a 2-4 inch type snowfall. After this event, we have a couple frigid days (Map reflected above) There could be a BRIEF warm up and then the "Motherload" of cold air is about to move into the US. That BIG L over Wisconsin is along the leading edge of BRUTAL cold air--and it would reach the East coast about 36 hours after that. This could be the coldest air mass in 25 years. (Thanks to something called the -EPO) Map valid 1/15/11 temps reflected again, at 5k feet. Note the -30 reading up in Canada. Snow threats--Maybe a few flurries or snow showers Friday, but the first threat is Monday/Tuesday Next week-- next, with an arctic blast like that I would guess we could get a quick coating and then we sit in the cold (Day 11). Maybe around the 20th as the pattern starts to relax something is on the table.